This year, in addition to the exciting and hilarious basketball hijinks fans have loved for decades, now at each game there will be over 20 opportunities before, during, and after the event for fans to interact with the Globetrotters. Before the game, fans with a Magic Pass will get to learn tricks, shoot hoops, and take photos on the court. And after each game, fans can participate in a free autograph session. Be sure to download the new interactive mobile app with exclusive features including an augmented reality basketball toss game and exclusive image filters to share with friends across social media. Don't miss a moment of the action and excitement as the Globetrotters captivate families with trick shots, slam dunks, comedy and exceptional displays of athleticism. 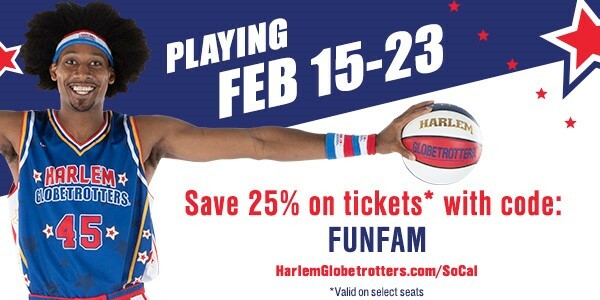 Get your tickets now at http://www.harlemglobetrotters.com/socal.